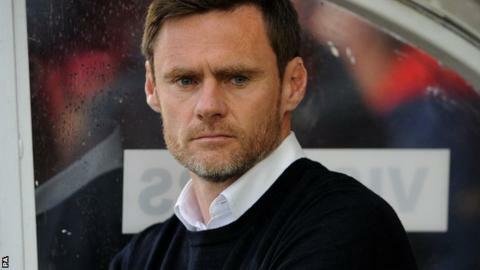 Fleetwood manager Graham Alexander has warned his team that there is still work for them to do if they are to reach the League Two play-off final. The Cod Army will take a 1-0 lead into Friday's second leg against York at Highbury, thanks to Matty Blair's second-half goal at Bootham Crescent. "I've been in the play-offs many times as a player and there are lots of twists and turns," said Alexander. "I'm looking for a similar performance, and it will have to be to beat York." The 42-year-old continued: "They're a good team and they finished in the play-offs for a reason. We go into Friday confident, but cautious as well, because we know it's not over." Blair, who scored the goal that took York into the Football League in 2012, netted against his former club to increase Fleetwood's hopes of a place in the final at Wembley on 26 May. A waterlogged pitch prevented the first leg from being played on Saturday and many Fleetwood fans were unable to travel to York again for the rearranged fixture, but Alexander was pleased to reward those who were there with a victory. "There were less numbers than Saturday but it's very difficult for people to get back over here on a working day," he said. "We feel sorry for those that couldn't make it again because we wanted to give them that performance on Saturday. "It is such a commitment to go to York twice in three days. It's fantastic and we rewarded them with a good performance." If the Cod Army do go up, it will be their sixth promotion in the space of 10 seasons. They were playing in the ninth tier of English football in 2004-05 and were promoted to League Two alongside York two years ago.